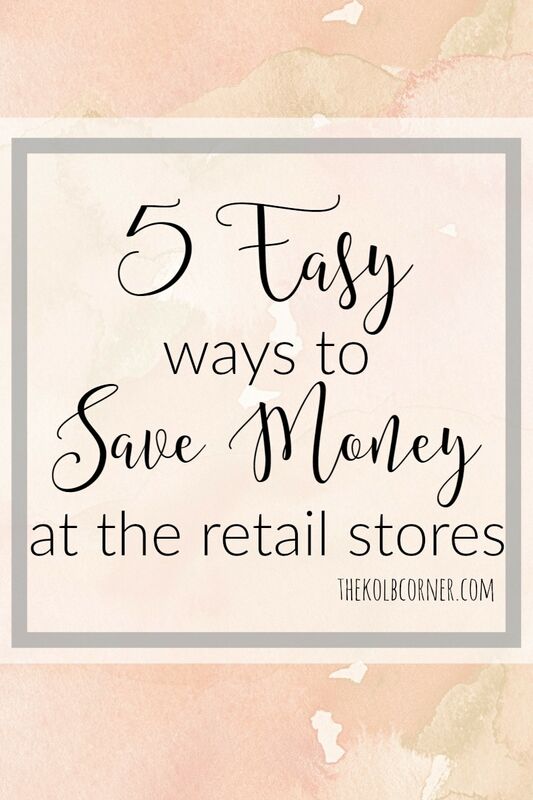 One of the biggest ways I save our family money–besides couponing–is by finding the best deals on things we need at the retail stores. I don’t know about you, but I absolutely HATE paying full price for anything! This goes for food, clothes, kitchen accessories, appliances, furniture–ANYTHING. So I came up with a list of how I save money at the retail stores. If you want to know how I save money on things in general, check out my How My Family Saves Money post. Sure, this may seem like a no brainer–but how many times have you been at Target picking up a few things and you see a super cute, can’t live without, top? Of course you just HAVE to buy it right? This would be an impulse buy, and it is how the majority of people waste money–myself included! Even my husband who I thought I had trained pretty well–and doesn’t like to shop for anything–will buy something just because he thinks he needs it NOW. Like his recent purchase of jeans at Kohl’s. Believe me, wait a few weeks and whatever it is you think you need to buy right this second–will go on sale. We are talking clothes, appliances, WHATEVER you can think of. It all goes on sale eventually and unless it’s something that broke or needs replaced right now and you absolutely cannot live without it–wait for the sale. You will save at least 15% and most times even more. This is another easy way to save money at the retail stores. A lot of stores have their own version of a loyalty card, whether it be just something they scan at checkout to take advantage of their sales–like Petco, CVS, etc, or a credit card like Kohl’s that when you use it, you save a % off your total. 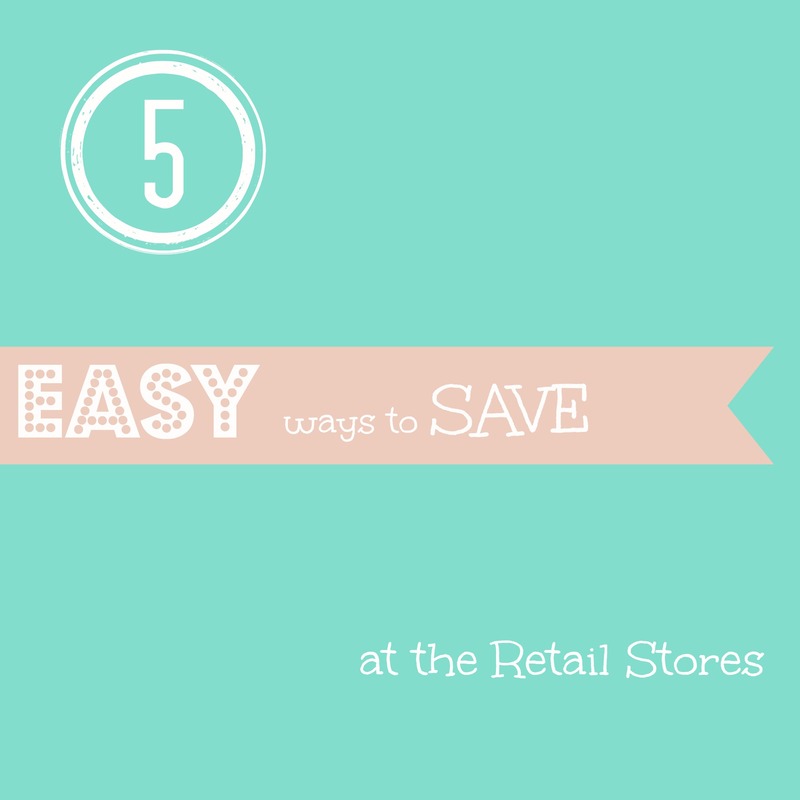 These are very easy ways you can save even more money when you are shopping. Target has the RedCard that you can link to your debit card. If you are a big Target shopper, like me, it’s an easy way to save 5% off your bill. While 5% doesn’t seem like much, it adds up over time. Probably my favorite rewards card would be Kohl’s credit card. This was the first credit card I applied for when I was 18, and for some reason was accepted. Of course, with any credit card, you need to practice restrain. The best part about Kohl’s credit card is that every month or two they send you a 15%, 20%, or 30% off coupon to use over a period of about a week on any purchase you use your credit card for. Plus they sometimes offer “kohl’s cash” which is cash back you can use on a future purchase. Combine this with an already great sale and you can get some really great deals! Other places you can save money using loyalty cards are the drug stores, like CVS, Walgreens, and RiteAid. With your rewards or loyalty cards, you can also get “cash back” deals that print out after a transaction. Use these for your next transaction to save money! If you do a lot of online shopping, these are two sites that you NEED to know about. Ebates is a site that offers cash back rewards in the form of a check for purchases made at participating stores online. All you have to do is go to their site, find the store you want to shop at, click the link and shop. It’s that easy! They frequently run specials where they will double the amount of cash back offered. The two sites I shop online frequently are Kohl’s and of course Amazon. Right now Ebates is offering 6% cash back on purchases made at Kohl’s. Again every little bit adds up! RetailMeNot is another great site that has coupon codes for just about any store you can come up with. Before hitting checkout, and paying for shipping, check out this site to make sure you aren’t missing out on a great online coupon, or a code for free shipping. If you are like me, you always check out the clearance sections at any store before checking out. Personally, I don’t really care if the clothes are for summer when it’s turning to fall, or if the pattern on those dishes is last season’s pattern. A good deal is a good deal. My two favorite place to shop clearance are Kohl’s and Target. I always have to do my “outside loop” at Target, which means checking all of the endcaps for steals. Ibotta is a coupon app that has more than just grocery store deals. They have deals on clothing, electronics, home & office and more. Before you get to the store, check the Ibotta app for “rebates”. Once you purchase the product that is in the rebate, you’ll scan the product and upload a picture of your receipt. The savings will be applied to your account, and you can have that money transferred to a PayPal account. Cartwheel is a Target specific app. Since I live at Target, I use it very frequently. In the app you have the ability to scan an item to see if there is a Cartwheel deal on it. The deals will rang from 5% off all the way up to 40% off. At checkout, the cashier will scan your barcode and the savings will automatically be deducted from your bill! Bonus: you can combine Cartwheel savings with coupons. Shopkick is an app where you can collect “kicks” when you walk in or scan items, at participating stores. You can save these “kicks” up to redeem for gift cards to retailers. Another app you can save money with is the Target Cartwheel app. You can search by category for extra discounts on items you will be buying. They even have furniture and home decor categories, so it’s not just for use with grocery shopping. What are some other ways you save money at the retail stores?